The following is information from the Indian Pueblo Cultural Center. The Indian Pueblo Cultural Center (IPCC) in Albuquerque, New Mexico has something for everyone during American Indian Week, April 24 through April 30: traditional Native dances several times each day, workshops led by Native art experts each afternoon, and artists offering authentic handcrafted work for sale. The Pueblo Harvest Café will serve breakfast, lunch, and dinner as usual, as well as host a special concession window in the courtyard. The last weekend of American Indian Week is unmissable for art lovers. The courtyard transforms into a bustling marketplace with over fifty artist booths featuring pottery, jewelry, paintings, and more. You can enjoy all the activities of the week-long cultural celebration with an extra emphasis on art. The Indian Pueblo Cultural Center is a world-class museum and cultural center created as a place where Pueblo people can tell their story. As the gateway to the 19 Pueblos of New Mexico, the IPCC is a necessary first stop for visitors to New Mexico, providing an introduction for understanding the state’s landscape, legacy, and story of continuance. 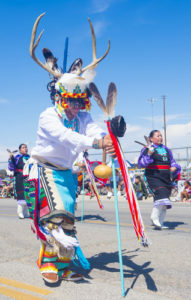 The IPCC hosts traditional Native American dances every weekend year round and offers an exciting schedule of cultural, educational, and community activities. The Indian Pueblo Cultural Center is located at 2401 12th Street NW, Albuquerque, NM, 87104. Call 505-843-7270 or visit their website here.